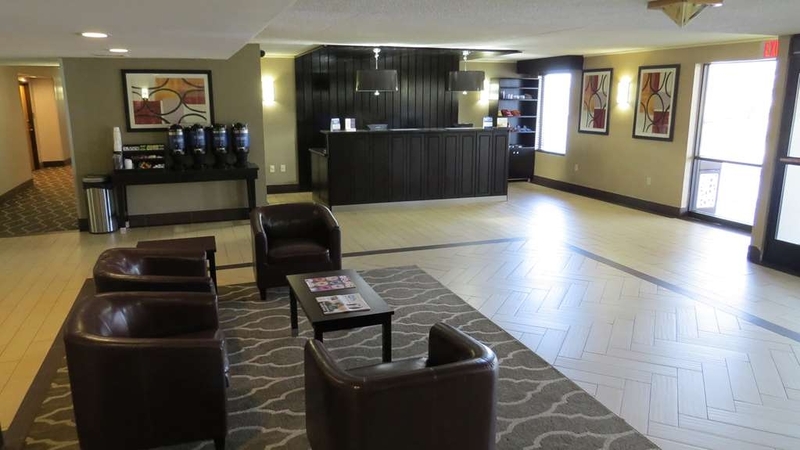 Il Best Western Harrisburg North è situato nel centro di Harrisburg. L'hotel è vicino alle principali attrazioni turistiche. Approfittate tutto l'anno del miglior prezzo garantito e di offerte esclusive. 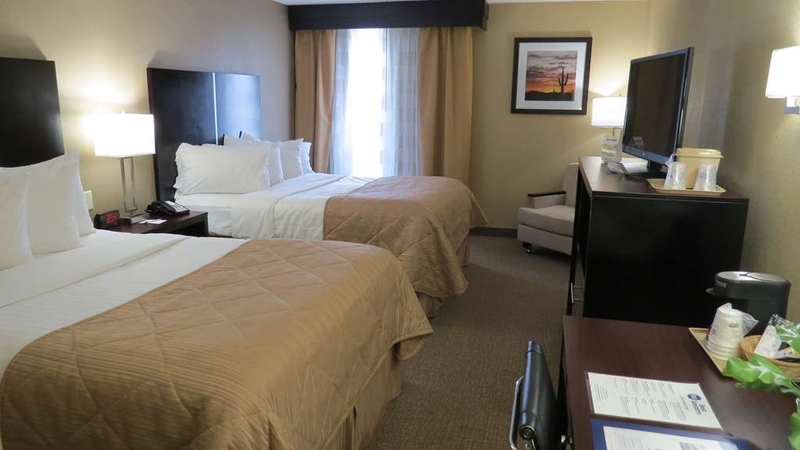 Il Best Western Harrisburg North Hotel è situato in posizione ottimale, proprio all'uscita dell'Interstate 81 vicino al Farm Show Complex e a meno di dieci minuti dalla capitale dello stato. Ci troviamo a pochi minuti da numerosi ristoranti e negozi. Se desideri partecipare a un evento presso il Farm Show Complex, visitare una delle numerose mostre di automobili nella zona fieristica di Carlisle o trascorrere la giornata all'Hersheypark®, il nostro hotel di Harrisburg, Pennsylvania, è situato in posizione centrale rispetto a molte magnifiche destinazioni. Inizia la giornata con una colazione completa all'americana, quindi controlla le e-mail utilizzando l'accesso gratuito a Internet ad alta velocità nel nostro business center, oppure guarda la TV sullo schermo piatto a 37 pollici nel confort della tua camera. Fai un tuffo nella nostra piscina all'aperto stagionale o concediti un po' di esercizio nella nostra splendida palestra. inoltre, potrai fare il bucato grazie alla nostra lavanderia a gettoni interna. Informati sulle nostre ampie suite per famiglie, che ti offrono un confort ancora maggiore. "Great except for watered down juice." Every juice we tried was watered down. We dont drink coffee or tea so juice was our morning beverage and it was so disappointing to have it taste so watered down. The front desk staff was awesome. The whole place was very clean. Thank you for the heads up on the juice, I will ensure the breakfast staff keeps an eye on refilling the machine when low or out since that is what makes it taste watered down. Next time you stop by please let us know so we can take care of any problems. Hope to see you soon. This hotel is conveniently located off I81. Clean, quiet. Breakfast room was clean and roomy. The food was hot and plentiful. beds were comfy with plenty of pillow choices! Would recommend this to people needing a room in the Harrisburg area ! Thanks for staying with us and providing such nice feedback. I will be sure to let the staff know of your kind words. We hope to see you again. Thanks for your kind words. The staff works very hard to ensure everyone enjoys their stay. I will be sure to pass this along. I am truly sorry for the fact that our policy is to have maid service to keep the cleanliness standards of the hotel. Your co workers who work the same hours as you did not seem to have the problem you experienced with having their rooms cleaned. We are sorry to see you go and do hope you will reconsider rather than staying at a property that doesn't want to clean your room. Thank you. We found the room to be very clean and the staff was super pleasant. I would recommend anyone to stay with Best Western of Harrisburg! I would have liked to use the pool but it was winter. Even though it sets next to the interstate we could not hear it. Thank you for staying with us. I will be sure to let housekeeping and the rest of the staff know you thought them "super pleasant!!" Come back and visit in the summer to enjoy the pool. This hotel gets overcrowded and when that happens customers park in the lot that is adjoining theirs (No delineation between the two) and are then towed in the middle of the night. Once you go to check out in the morning you car is no longer there. The receptionist is however ready and waiting with a number for the cab and towing company so that you may go get your vehicle with nothing but cash. 3 miles down the road taxi $20 - $272 to get your car out. Entire vacation ruined. Multiple customers towed. Nice profit. We wonder how much of a kickback the owner gets. I am very sorry your car was towed. Unfortunately we have tried to work with the owner of the lot next door and have even offered to buy it and he WILL NOT work with us. The best we can do is post the sign at the desk, and the signs at the entrance to the parking lot are rather large warning no one to park there. We do not appreciate you thinking we get some sort of "kickback" when we have tried our best to keep people from parking there by posting it everywhere. I want to commend BW on an excellent service. We have had parties there for several years and I really appreciated the level of service we had this past December. The food was excellent, as always, and everyone spoke afterwards of how much they enjoyed the format and quality of food. In addition, James, who I believe was lead server, was extremely attentive, constantly monitoring the flow of service and stopping at tables constantly to check for our needs and satisfaction. Thanks Best Western, and thank you James! Thank you for the kind words but unfortunately I believe this review is for the Best Western Premier since we do not have banquet facilities. The staff and facilities were great. I had a good night's sleep followed by a pleasant breakfast. I will definitely be staying here again if I am in the area. This hotel is on my "speed-dial". It is close to the highway so it is easy to get too. Thank you for staying with us and we look forward to your return. I will be sure to share the kind words with the staff. The beds were comfortable. Heating and cooling of the room were great. It was just what we needed for a one night stay. Everything in the room seemed new. There is a refrigerator and microwave in the room for added convenience. Thank you for staying with us, I will be sure to share your kind words with the staff. 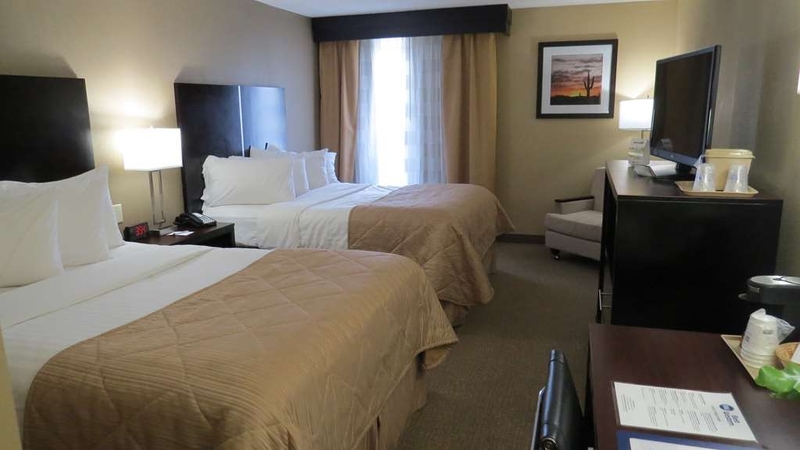 We selected the BW for a 2 night stay while visiting the PA Farm Show. Great location with a quick drive to and from. The staff were all very friendly and helpful. The room comfortable and especially the bed. Only downsize is the traffic noise from the highway which did not hold me back from a good night sleep. My stay could not have been any better. Reception I met Leo who was efficient and friendly. Explained the area and provided information on breakfast and places to eat. I asked for late checkout so I could shower after the marathon. Always a dicey subject, depending on turnover for my day of check out. Breakfast on the one day I had a chance to eat and was varied and of good quality for this type of buffet. Coffee was greatly appreciated. Room was clean on arrival. Lobby clean well laid out. Overall a great stay. Thank you for the positive feedback. We always welcome our guests feedback and love to share the positive with the staff. Hope to see you again in the near future. I can't imagine what people expect from a budget hotel, but this experience was beyond what we thought we'd get for our money. First off, the staff is friendly, courteous and helpful. The room was incredibly clean and comfortable- our only regret is we didn't have the luxury to spend more time there! The free hot breakfast was plentiful and the surroundings were also clean. What more could you want? There is also a small gym and pool, but unfortunately our time constraints didn't allow us the use of either, although they did look inviting. I highly recommend this hotel if staying in the area. A bargain for the money. Don't forget to ask for the AAA discount, if you're a member. "Easy access to I-81 S, Attentive Staff, Needs some updates"
We arrived at the hotel very very late due to traffic delay experiences and a blown out tire. The person working the night desk was nice and very very helpful. He had to switch our room as the one we were supposed to have already had someone in it. BUT as long as there was a room for us, and it was one the 1st floor we were happy. Positive experiences: Room was cleaned every day. Breakfast was good with some hot items to choose from. Staff was helpful. Not so positive: The couch had a retro look from perhaps the 40's/50's, a gold velour that was sunken in the middle. It was ok to sit on, may not have been good to sleep on. The space between the door and the frame was at least an inch wide. Lots of light flowed in during the night. with 3 locks to hold it shut we felt safe, but it could be improved. Since we were close to the breakfast area and lobby, it was quite noisy in the morning. It was like a wake up call. Being so close to the freeway at times you could really hear the truck traffic, but that's what you get for the convenience of being able to get on the freeway quickly. The carpet looked like it had not been replaced in a long time. There are renovations that could still be done in this hotel. The lobby must have been redone fairly recently as it was very nice.Otherwise the hotel still needs to have some things done. Getting to our room from the back parking lot was like walking through a maze, But we soon mastered doing it. Didn't go the wrong way even once. "Don't even bother staying here!!!" There are not enough words to explain how terrible this hotel was. By far the worst place me and my family ever stayed at. First when we got to our room, the air conditioner wasn't working. Then in the morning while attempting to take a shower the spout shot off the wall hitting me in the leg. The water shot straight out of the wall. I complained about it. The girl at the desk was very nice. She said they will take care of it. So after a day out I attempted to take a shower again. Then the same thing happened. The spout shot off the wall and landed on my toe and cracked it in half. Again, I complained. I wanted to speak to a manager. I was told that the manager was not there. So basically I was told to call and speak to someone. So, I called to complain and the lady told me that my rate was already low and shouldn't have been that low. I said that doesn't matter that's what I paid. She wanted to give me a few best western points. That's it. I wasn't happy with that. I tried calling again, and nothing. I got an email apologizing. And I wrote back to say well I need to be compensated somehow and no response. So, take my word on this, DON'T stay here!! Take your business elsewhere. "Nice staff, hot breakfast, convenient location for travelers"
We stayed one night while traveling; easy on/off highway. Staff was very pleasant. Hot breakfast was great! Our room was very clean, good mattress, and quiet. We would definitely chose to stay here again. "Don't waste your money "
We had a family suite for 6. It had 2 rooms. A bedroom with 2 full size beds & bathroom. The other room was like a living room with chairs coffee tables & a couch bed. Thank God I brought my air mattress because no one was going to sleep on that couch bed. The couch itself looked like a V. The middle so sunken in you couldn't even sit on it let alone sleep on it. The lighting in the room was very odd. There were plenty of lamps however the room still seemed dark. The showers in both bathrooms were clogged and the water would not go down. Call the front desk to complain and they said they would take care of it but no one ever showed up. The water took forever to go down. The breakfast buffet wasn't anything to write home about. The whole set up of the buffet area was ridiculous. Everybody just seem to be standing around waiting for people to get out of the way. Needs to be re-designed.. The elevator took forever it was very very very very slow. The whole entire hotel needs a total makeover!! "Was fine but not great"
Hotel was clean and comfortable. .but TV wasnt working and we had 2 children with us.was fixed but worked temporarily only.Fortunately we didnt spend much time in room.Breakfast was very good with a wide selection. If I could give it less than a 1 I would have. Faucet on whirlpool tub fell off when it was turned on, the when we got another room it was filthy it had not been cleaned. Avoid at all cost the worst hotel experience ever. "I strongly wouldn't recommend this hotel to anybody!" One of the worst hotels I've ever been to. We had a broken shower that my husband had to fix himself, we had light bulbs that went out, and also it smelled like sewage backup in the hallway ... and the staff didn't really seem to care. I think the only two things that were okay were the prices and the breakfast selection. Other than that, it sucked. We'll be sticking strictly to the Hampton/Hilton hotels from here on out. "I wish I had read the reviews first..."
This hotel needs some repairs. It appears that Best Western has just taken over a Clarion hotel and it was the nastiest Best Western I've ever stayed in before. The rooms were dirty and although they have newer tile in the rooms, the rooms smell, my son sneezed the entire time we were there which was luckily only two nights as we were visiting Hershey Park and Chocolate World. I noticed there was a hole in the ceiling above the shower that was pretty creepy so we changed rooms immediately. The staff an the front desk were very nice and it's not their fault the hotel needs repairs and to be cleaned better. I would not recommend staying in this hotel. I really wish I had read the reviews before booking. "Staff worked really hard to make us happy"
We checked it here, and it took 3 tries to find an acceptable room. 1st room was right next to the laundry (131 or something). The chemical odor as we walked down the hallway to the room overwhelmed my wife, and back to the desk we went. My wife went with the front desk clerk to check out the second room and she came back saying it would be "okay", but it had a musty odor. She was mumbling all way down the hallway as I was pushing the cart. The front desk clerk came hurriedly down the hallway telling here that, "She wanted us to be satisfied with our room." That is when they went off to a 3rd room. This room was more than acceptable, clean, comfortable and quiet. Breakfast buffet was acceptable. They never are exceptional in these type of hotels. This is a really nice hotel. We booked through AAA and got an outstanding rate, which included breakfast. The room was very clean and the beds were not too hard (as you get older, this counts a lot!). Staff were very friendly and breakfast was OK too. I've paid an awful lot more for hotels way below the standard of this hotel. We will definitely use this hotel again when passing through Harrisburg. "Great value plus newly renovated." What a nice surprise. We were on the road and we decided to use booking.com to find a place around Harrisburg. 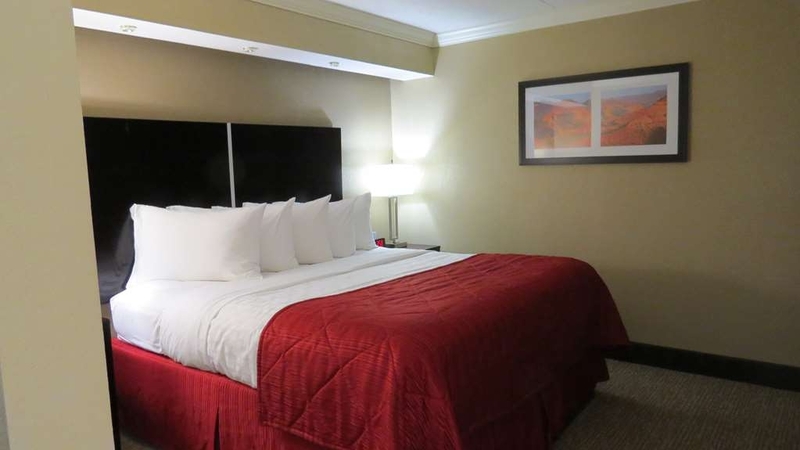 This Best Western popped up for $99 a night. We usually stay at larger change hotels. But for the price we couldn't go wrong. Much to our surprise it was originally a Clarion Hotel that has been totally renovated and now is a Best Western. The place was beautiful. Plus there was a Marconi Grill around the corner for dinner. Stayed here recently for a soccer tournament with my daughter and her team. While my room was fine, two of the families had air conditioning units that did not work. I was surprised at the lack of service. You know going into a two-star place that it won't have many frills. But all I ask is that it is clean and not falling apart. This hotel was that. Surprisingly clean and in good shape (I have no idea how another reviewer felt it was "run down"). It's for sure an older building, but there are plenty of attempts at modernizing it. The wifi worked perfectly fine. Road noise is what it is, but it wasn't that bad (this coming from someone who is a light sleeper). Breakfast was fine too. I didn't have anything more than basic interaction with the staff, but they were nice. Parking is a bit tight (and the spaces are small) but that's been covered plenty of times. 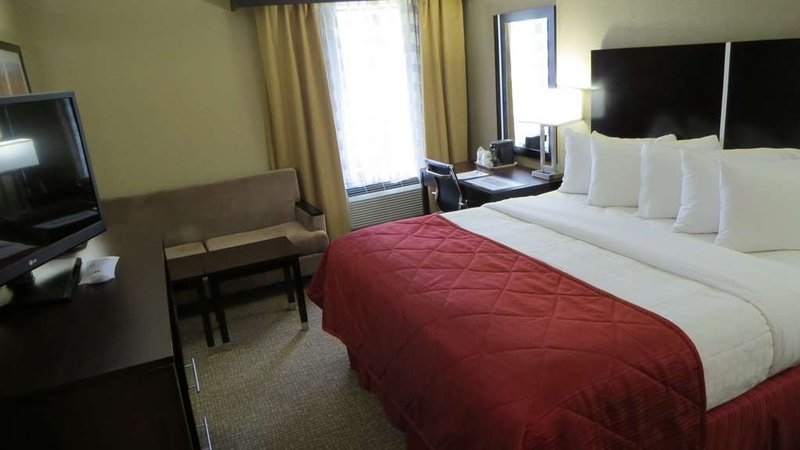 If you're in the market for a budget hotel, this is a good one. Sure I've stayed at nicer places with better amenities. But for this particular stay, I just needed something basic, and this was it. "I would stay here again." This place was very clean & easy to get to. My only complaint would be it was a little noisy as it's situated close to the highway. But I've stayed at a lot noisier. Good value. Staff was friendly & place was well maintained. 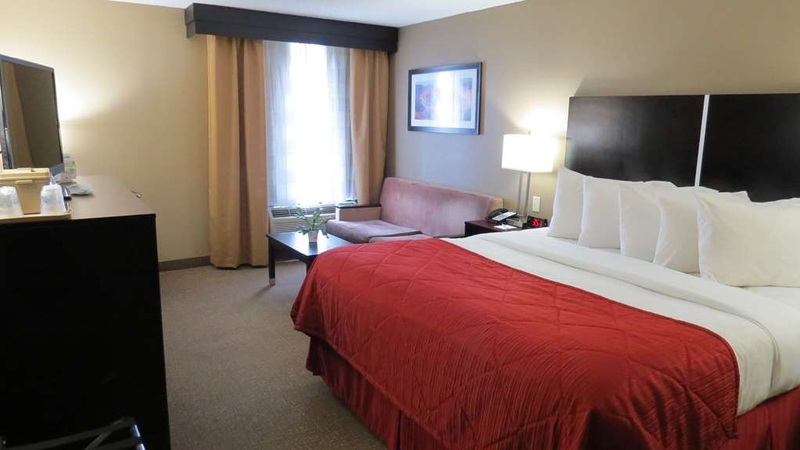 Hotel is directly off highway which is convenient for those looking for easy access. You will hear hear highway noise constantly so be aware. However I recommend you skip this hotel and head across the road to the Springhill Suites or Hampton Inn. This is just not nice and the 2 stars is me being generous because I was leaning more toward one star: We were assigned to this hotel as a team in a stay to play tournament otherwise I would've have stayed. There is extremely limited parking, definitely not enough if they are near capacity which because teams were assigned here they were. There are signs on doors telling you not to park in adjacent building's parking lots or you'll be towed but not where to park when no space is left. The front desk staff and we experienced several were not knowledgeable or familiar with local area. Check your rate as they tried to change several of our group's agreed upon rate higher. 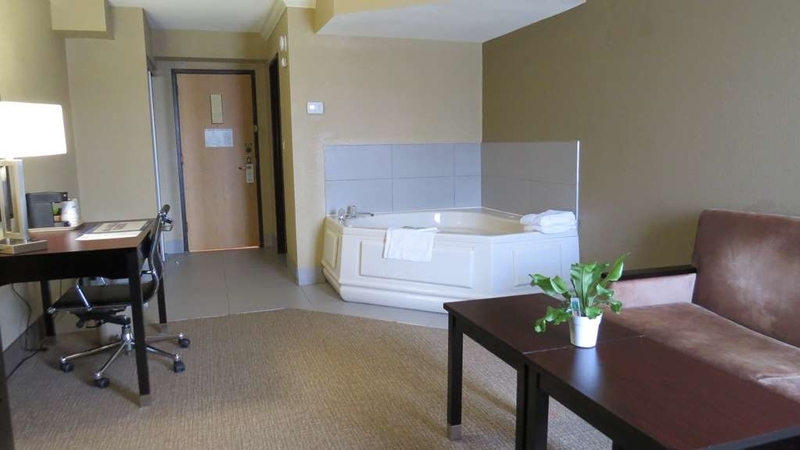 Our “2 bedroom suite” is actually a 2 bathroom suite with 2 full size beds in one room and a sorry excuse for a sofa bed and 2 chairs in a “living room” type format with 1 bathroom on either side. The sofa bed had a 1/2 inch mattress so under no circumstances should expect to sleep on it. The bathroom shower In room 102 leaks extensively actually floods into the hallway from the wall and I mean floods requiring 3-4 bath towels each time it's used. This water situation explains the mold and mildew I suppose. The Sheetrock is crumbling from the bathroom ceilings. We told the staff about the flooding and housekeeping removed the soaked pile every day but nothing was ever done and it is a major hazard especially the first time it happens and you slide through trying to maintain your footing. The floors and elevators are filthy. The laundry room has possibly never been cleaned I'm pretty sure. The lobby area is tiny. Breakfast is mediocre low quality free hotel food standard, they did accommodate our need for early breakfast. If you must stay bring Clorox wipes and your slippers so your feet don't touch the floor. If the choice is yours however don't choose here. Spent the weekend in the Harrisburg, PA area. The hotel was nice, but there were a few issues. 1) There was no wifi in the room (either on the phone or the laptop). 2) No bath mat for the floor was provided for the second night. 3) And I consider this a BIG issue. Our room keys did not work the second night, I returned to the front desk, and she gave me new keys, However, she never asked my name or confirmed my ID. I could have been anyone off the street. I had not seen this person prior. This is a huge security problem at this hotel. Why, when someone checks in, are the keys not valid for the entire stay? This issue drives me crazy! "Hope the bug bites aren't from bed bugs..."
When I first checked in my door wouldn't lock properly. The explanation "it happens when it gets cold out" They had me switch rooms, my new room faces the highway...sounds like the trucks are driving right through your room! The internet / wifi doesn't work. No one is very helpful. Two nights there were loud kids running up and down the halls very late at night. There is mold growing on the show curtain & I woke up with welts on my arms. I am hoping its not bed bugs! The "office center" is a joke as well. Wouldn't be my first choice again for next Farmshow.